The wall lights up, but you are only allowed to climb it in the daytime. 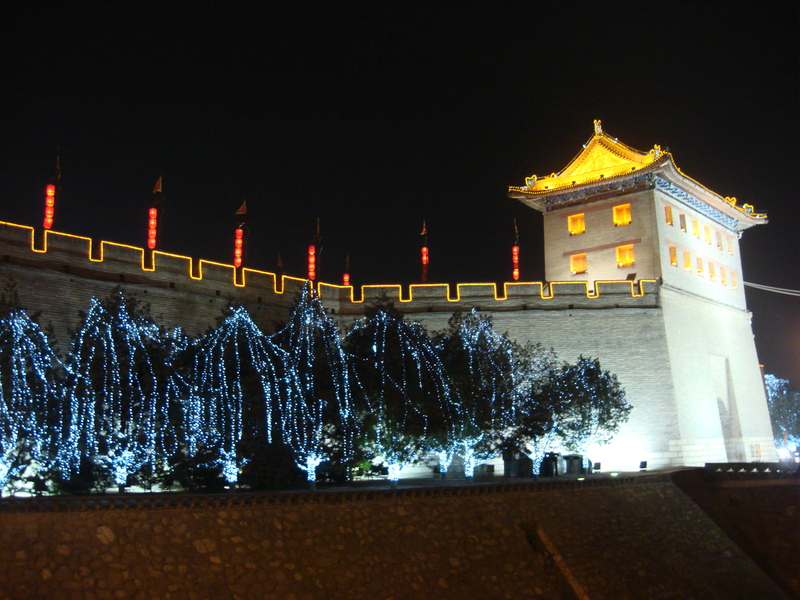 The wall of Xi’an is considered one of the best preserved city walls in all of China. In ancient times, it was customary to build a wall for defense around entire cities, keeping guards at watch tower posts. Guards still remain today, but they are more for touristic purposes practicality. The wall is one of the tallest in the world at 12 meters tall and has a circumference of nearly 14 km. There are plenty of entry points open to tourists in every direction. This is the biggest musical fountain in Asia. It is quite amazing with water and fire shooting out of the holes. I don’t recall what this mural represented anymore, but nonetheless it is very pretty. Only 4 km south of the walled city, the Big Wild Goose Pagoda and Musical Fountain are quite the sites. Twenty two huge jets of water shoot out to a beautiful melody complete with fire on some occasions. The stone pagoda is also rare for its size given that it is made out of stone. Be advised that the fountain doesn’t play at all times and has a schedule that changes from time to time.